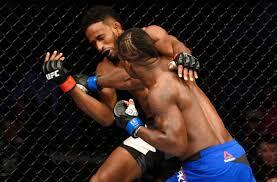 Free Agent Lorenz Larkin hopes to have the next step in his career finalized this week. 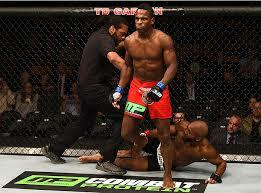 A couple of weeks ago, welterweight contender Lorenz Larkin ended his three months of exclusivity with the UFC as far as his free agency status goes. The question remains, where will “Da Monsoon” end up? Larkin (18-5, 1 NC, 5-4 UFC) ended his latest UFC contract producing a fireworks display against streaking contender Neil Magny in the Featured UFC Fight Pass Prelim fight at UFC 202. Since the highly touted performance to crack the Top 10 in the UFC’s Welterweight Division, Larkin has watched the three months tick away as he, along with his management, can now talk the next step of his career with any organization interested in his services. For someone who has never been in this position before, Larkin seems very calm, cool and collected with the process. After a slow start to his UFC career, Larkin dropped down to Welterweight compiling a record of 4-1, with the one loss being a very questionable split decision to Albert Tumenov in January at UFC 195. He bounced back with a split decision win of his own back in May over Jorge Masvidal, and then the biggest win of his career over Magny back in August. With a fighter as exciting as Larkin, interest has been expressed in his services from multiple organizations, including Bellator MMA. Larkin has a relationship with Scott Coker and Rich Chou from his days fighting under the Strikeforce banner. While attending Bellator 163 last month at Mohegan Sun, Larkin got to experience the Bellator product in person. As impressed as he was with the production value that Bellator presents, Larkin has always been impressed with Coker’s business acumen. With Bellator, Larkin feels like his options are a plenty, combining MMA, Kickboxing, and potential other avenues of success in the organization. Another organization that has interest is the up and coming Rizin FF. The international feel of Rizin presents a different kind of challenge, outside of fighting itself. While dollars and cents are always very important to fighters, Lorenz Larkin looks beyond getting in a ring or a cage to give fans their money’s worth. Larkin’s main concern, regardless of who he signs with, is to sign with a promotion who believes in him, and that will, well, promote him. “The thing is, a lot of people have these outlooks like fighters just become this big entity by themselves, which to me is not nowhere near as true,” Larkin continued. “If a fighter doesn’t have a promotion backing them and putting them on platforms to display their character, the normal fan will never even notice them other than when they fight, that’s it. It’s all about if the promotion is behind you and they’re gonna do stuff to promote you, and then with that, plus your character and your fighting, that’s what builds a draw. Larkin wants to keep his options open, whether signing the standard 4 or 8 fight deal. He sees the positives in both, as long as he receives promotional backing, is able to do appearances, and work the way he would like to. 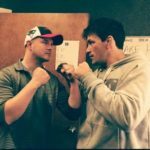 Larkin is looking to have his next fight in early 2017, whether it be with Bellator, Rizin, or the UFC, who is also interested in re-signing him. The fans have made it known to him on social media, and other outlets, where they would like to see him fight next. Larkin is hoping to have his decision made and put pen to paper sometime this week. Who he will sign with? That’s a question that one of the world’s most exciting welterweights doesn’t have the answer to quite yet. Lorenz Larkin’s final message to MMA Promotions and their fans worldwide as his free agency could come to it’s conclusion? Subscribe to the SFLC Podcast for FREE!